The North American tundra is located at latitudes 60° to 85° North and longitudes 55° to160° West which includes northern parts of Canada and the state of Alaska. The tundra is a cold barren wasteland that includes snow, rocks and very little variety in vegetation. It is in this place where the Arctic fox is found. The Arctic fox (Alopex lagopus) makes its home in small burrows in frost-free ground, often in low mounds, or in rock piles. Because the Arctic fox is a scavenger it can usually find food to eat. Sometimes the fox will follow Polar bears or other predators and feed off the remains they leave behind. The Arctic fox is about 10 -16 inches long and weighs about 6-12 pounds. It is about the size of an ordinary domesticated house cat. It has short legs a long bushy tail that it uses as insulation by wrapping it around itself when sleeping. Its long hair is white in the winter, and "blue" or gray in the summer. Its head has a stubby muzzle, small ears, and large eyes. Its feet are lined with fur, which helps it conserve heat. The Arctic fox has adapted a stealthy movement due to its predatory nature. Both male and female mature sexually at one year of age. The mating season is May-February and the gestation period for a pregnant female is 52 days. The number of pups born can range between 6-19, and the newborns weigh approximately 2 ounces. Whelps are helpless and blind when first born. They nurse until they can eat solid food. Both parents care for the pups. The mother raises the young while the father hunts for lemmings and other food. They start to eat solids after 6 weeks and leave the den after 14-15 weeks. The whelp is usually dependent on its parent from summer to fall. Mortality rates for young foxes is very high. An average life span for the arctic fox is around three years. The Arctic fox is a solitary animal. Arctic foxes usually live to 15 years of age. It is an omnivore (one who eats both plants and animals). A typical diet of this fox consists of birds, eggs, small mammals and fish. It will also eat berries, seaweed, insects and larvae, when other prey is scarce. The Arctic fox is a predator to lemmings (one of it's favorite foods) and voles, among other creatures. The population cycles of lemmings and voles are largely dependent on the arctic fox. The fox is prey to wolves, polar bears and golden eagles. Because it is a scavenger, it keeps the environment clean by eating dead animals and keeping the rodent population down. The Arctic fox is a diurnal creature. 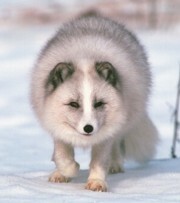 The Arctic fox has adapted to its environment by growing long fur that changes color with the season for camouflage. It tends to eat whatever is available. It s movements are stealthy due to lack of cover on the tundra. Its legs, ears, and muzzle are short to conserve heat, and uses its tail like a muffler when cold. The Arctic fox is not endangered world wide and it is estimated that there are several thousand arctic foxes left in the wild. Two arctic fox populations are endangered, however. One in Russia has been reduced to around 90 animals because of a mange caused by ear ticks introduced by dogs. The second in Fennoscandia (Norway, Sweden, Finland, and Kola Peninsula) was caused by over hunting around the turn of the century. The total number of breeding pairs there is about 140. "Arctic Fox", Card 5, Wildlife Explorer, International Masters Publishers, USA 1998. Bernie, David and Wilson, Don E. Animal. New York, N.Y. D.K. Publishing,2001. Tannerfeldt, Magnus, PhD., "The arctic fox and its exploitation by man"